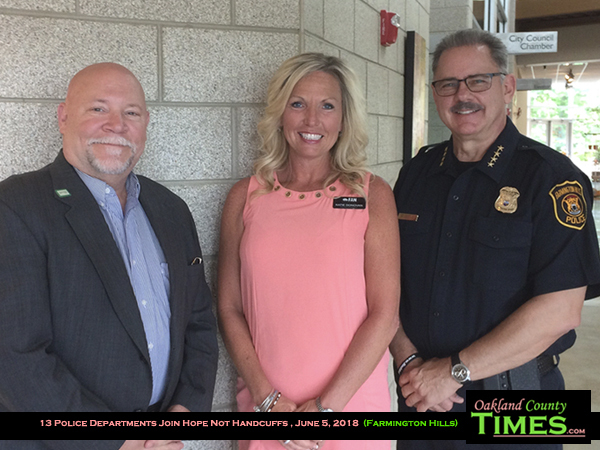 Bloomfield Township, Clawson, Farmington, Farmington Hills, Huntington Woods, Madison Heights, Royal Oak, South Lyon, Southfield, Waterford Township, West Bloomfield, White Lake and Wixom, MI – The Hope Not Handcuffs program began in Macomb County with a simple idea, giving police department the tools and connections they need to get addicts help without fear. The program launched in Feb 2017 by Families Against Narcotics (FANS) and has helped over 1,200 people get support for giving up addiction. Departments in Genessee and Lapeer County also came on board. The City of Ferndale and the Village of Holly also started offering the program in 2017. Thirteen police departments in Oakland County have now joined them, with the announcement taking place Tuesday at Farmington Hills City Hall. Now those seeking help with drug addiction can go to police stations in Bloomfield Township, Clawson, Farmington, Farmington Hills, Huntington Woods, Madison Heights, Royal Oak, South Lyon, Southfield, Waterford Township, West Bloomfield, White Lake and Wixom to request help. Once a person comes into the station, police contact the “Angel Coordinator” for the group. The police also have an “Angel box” that has comfort items to hold over the person until their “Angel” can arrive, including a blanket, bottled water, and granola bars to give them some comfort as they wait. Police do an assessment and the Angel helps get them into a recovery program, immediately if possible. 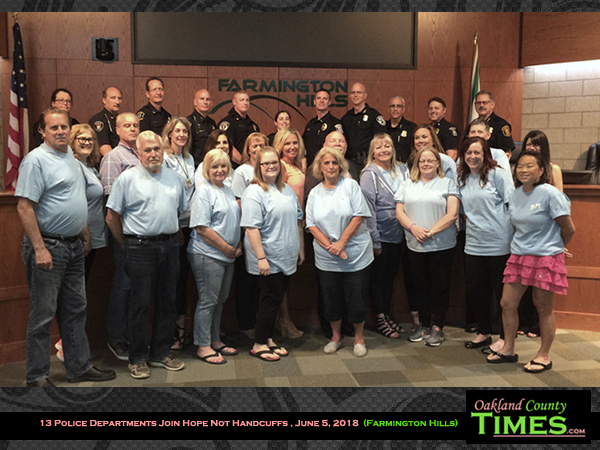 FANS also accepts and trains volunteers for the Hope Not Handcuffs program. To learn more visit www.hopenothandcuffs.com.